The fanless, space-saving PANEL12 is specifically designed as front-end interface for rugged, secure sensitive environments where reliability and quality are major issues. It combines a 12" display with excellent optical specifications, an optional touch screen and a complete low power Pentium based Single Board Computer (PIP). 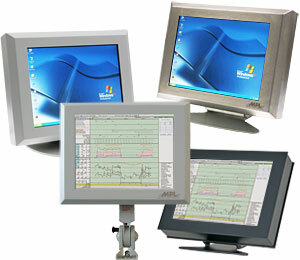 All this comes within the footprint of a 12" LCD monitor and saves space on your working place. The PANEL12 can be mounted over a standard VESA75 on a swivel arm, an adjustable desktop stand or on the wall.The user has the choice between a completely chromated and externally powder coated aluminum or a full stainless steel housing. The front is always IP65 protected, where on the back either through IP65 protected cable openings or behind a cover plate (IP54) various PC interfaces are available for the user. The robust and all around IP65 protected PANEL12 is the perfect solution as man machine / front end interface in harsh applications like in transportation, maritime or for clean environments like in medicine, food industry. Further as space-saving, IP54 protected, fanless and noiseless system the PANEL12 is an excellent solution for desktop applications in telecommunication, kiosk information systems and Internet access points where a quality product is an issue. Fanless IP65 aluminum housing (externally powder coated), capable to incorporated a 12.1" TFT display, protective glass or a touch screen, any PIP board including HDD/Flash, RAM, and expansion option of one PC/104 or PC/104-Plus. Mounting over VESA75. External cables: Ethernet, USB, PS/2 and Power (others on request). Fanless IP52 aluminum housing (externally powder coated), capable to incorporated a 12.1" TFT display, protective glass or a touch screen, any PIP board including HDD/Flash, and RAM. Mounting over VESA75. External interfaces: 2x PS/2, 1x RS232, 2x USB, Ethernet, and Power (others on request). Fanless IP65 stainless steel housing, capable to incorporated a 12.1" TFT display protective glass or a touch screen, any PIP board including HDD/Flash, RAM, and expansion possibility of one PC/104 or PC/104-Plus. Mounting over VESA75. External cables: Ethernet, USB, PS/2 and Power (others on request). 12.1" XGA (1024x768) TFT display in extended temperature (-30°C to +65/70°C), inverter for the LCD, cable connection between PIP and TFT and 2mm TFT glass protection all built together and connected into the PANEL12 housing.